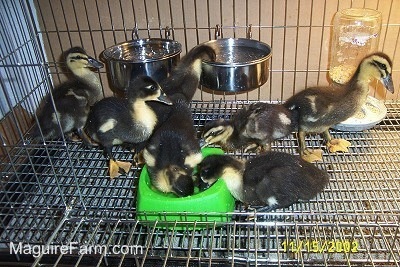 The ducklings outgrew their last living arrangements in a little over a week! They could mess their old cage in less than one hour and when I say mess, I mean MESS! The poultry water feeder was no longer working forthem. They played in it and emptied it in less then two hours. I tried giving them two poultry water feeders and they emptied two water feeders in less then two hours! To ducklings, water means playtime! Also, when duckling are about a week old they need to get their full head under the water to clean out their noses, yet they cannot spend the whole time being wet. 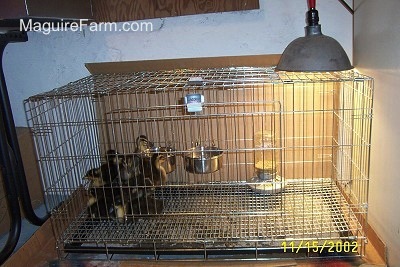 A bowl on the floor of the cage would be constantly played and pooped in. They do not have feathers and would get cold and sick of they were constantly wet. The solution... (for the moment anyway) are water dishes which hang off the side of the cage. 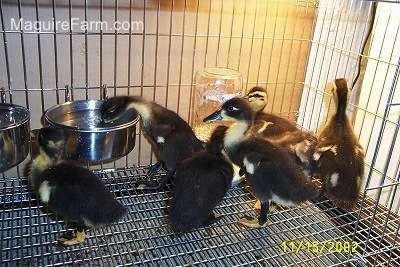 The ducklings cannot swim in the water, yet they can get their full head in it. 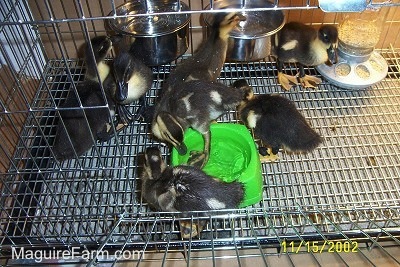 Their feet are now big enough for a grate bottom cage with a slide out tray. Kitty litter is placed in the tray to absorb their constant waste and to makecleaning easier. 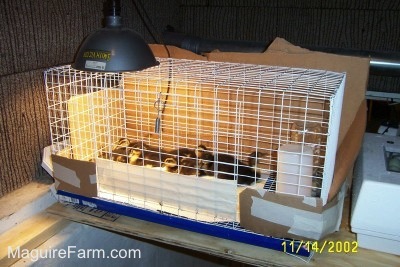 The ducklings no longer need the sides of the cage card boarded and taped up because they are too big to squeeze out of the cage, which is exactly what they did when they first hatched! Cardboard is however placed under and in back of the cage to prevent poop from getting on the floor and wall. The ducklings will squirt it out in any direction. 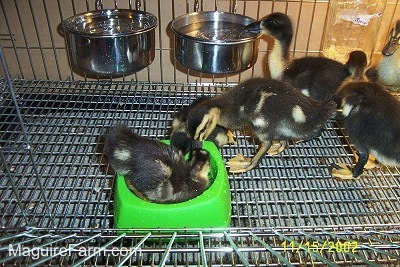 The ducklings are given a bowl of water to have some supervised water play. They cannot resist jumping in the water!